The Allora MXPT 5801 pocket trumpet features the classic black nickel finish and large sound for such a small instrument. This is a popular model by Allora, one that has received plenty of positive feedback from consumers. The compact size and smooth finish will make this trumpet a beautiful addition to your collection of instruments. This model stands at the top of its class and it looks the part, with its unique black nickel finish, that lend it a vintage, high class look. It is as functional as it is gorgeous, with slick valves that allow for quicker hand movement. A pocket trumpet is a good alternative when a standard sized one isn’t available or you need a smaller model for the road or to practice with. Additionally, because they offer a sound that’s comparable to a traditional model, many beginners choose a compact version, because it’s more affordable. This trumpet is no harder or easier to use than a traditional one, but it has two major advantages over it bigger cousins: small size and affordable price. Some musicians, despite having a deep love for all brass instruments, will hesitate when it comes to purchasing a pocket trumpet, because not everyone considers it a real instrument. However, this sleek model by Allora is produced in the same manner as a standard model. Like any good pocket trumpet, it is pitched in Bb and equipped with the same length of tubing as a standard model. The tubing is wound much tighter, which works to significantly reduce the overall size of the instrument. The cylindrical bore marks it as a trumpet, not a cornet, but the bell diameter is much smaller than on a standard model. The smaller bell combined with the more tightly wound ends up restricting airflow more than what you expect from a traditional model. This results in a tone that’s somewhat thinner and a horn that’s not as free blowing. This model is very practical for traveling musicians who don’t have much space to spare in their baggage. It is also a great choice for a vacation, so you can prevent your the lips from losing their touch while you’re away from home. If you normally use a standard-sized trumpet mouthpiece, you’ll be able to use the same mouthpiece with this model. This instrument features a 459 inch lead pipe, a brass bell, a stainless steel piston, and a first and third slide adjustment. The fixed ring is equipped with stainless steel valves and the whole thing is finished in deep black nickel with a touch of brass for highlights. 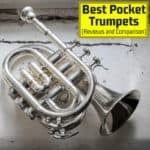 This model is perfect for the traveler or the beginner and is one of the best pocket trumpets on the market to learn on or practice with. Aimed toward both the novice and pro, you’ll be pleasantly surprised at the rich, loud sound that comes from this small package. Consumers rave about the MXPT 5801’s performance, stating they were able to easily play high notes above the staff, just like they would do with their normal-sized versions. Thanks to the compact weight and design, users can tote this model around with ease. Many consumers found this model easy to play and reasonably priced. It is very responsive, offering a vibrant sound and there is a ton of mouthpiece space, which is always a big bonus. The etching and plating is sharp. Maintaining this instrument is quite different than what many consumers are used to with a standard-sized version. Taking out the piston valves or oiling the valves can be tricky. With a traditional model you would simply turn the piston valve, locking it in place. When you try to do the same thing with this model you’ll quickly find that it has a couple of different positions that it can be locked into. If you don’t know this and fail to make the correct adjustment, you’ll meet a ton of resistance when you try to blow. Both of the piston valves have an engraved number. The component they belong into also has an engraved number. This allows you to match numbers and be sure you are putting the right valve in the right place. Still, it can be a bit tricky at first, since you need to match the holes found on the inside of the model to the outside of the piston valve and try a number of locking and turning combinations before you get it right. While consumers didn’t consider the valves to be a major problem, it was somewhat of an annoyance to have to ensure that the valves were in the correct position. Some consumers also noted that there are places in the range where the sound control will need more user concentration. Another consumer reported that the valves were sticky at times, but this is likely due to the type of valve oil they used. While most consumers rave about the black nickel finish, some were disappointed that there were no other options, like a traditional brass model or something with a vivid color. Consumers who are looking for a package that includes a lot of extras, or who want more color options, should check out the bestselling Sky band-approved brass Bb pocket trumpet, which sells for a comparable price. As we have mentioned, there are some issues with the valve setup, but this problem is relatively minor and only has a small effect on our opinion. Consumers who purchased the Allora MXPT 5801 Black Nickel Pocket Trumpet gave it a rating of five out of five stars for the fair pricing, the gorgeous black nickel finish, the weight and the overall quality. The MXPT 5801 is definitely a must-have for the musician who doesn’t want to fall out of practice. You get a lot of instrument for a low price, including a large sound, a sleek finish and a tight design. All of this add up to a very dependable instrument that’s perfect for use on the road. It scores a Musicaroo rating of 4.8 out of 5.